Home / Environment & Ecology / What is PM2.5? PM2.5 is all around us, whether you know it or not. 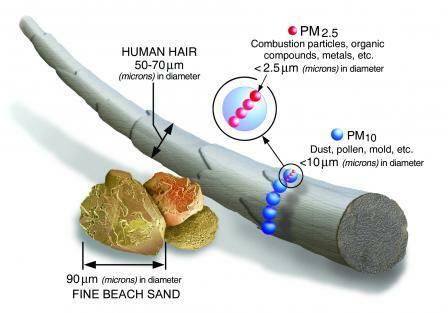 In general particulate matter, or PM, is the term for particles found in the air including dust, dirt, soot, and smoke. These particles can be suspended in the air for long periods of time. PM2.5 more specifically, is considered to be a small particle that is released into the air due to diesel and vehicle pollution, fuel combustion, and industrial processes. PM2.5 can have horrible effects on humans today because the particle travels deeper into the lungs due to its size. It is also made up of things that are extremely toxic like heavy metals and cancer-causing organic compounds. Specific health problems due to PM2.5 include coughing, wheezing, shortness of breath, and aggravated asthma. Who is most at risk of experiencing harm from PM2.5? About 1 out of every 3 people in the United States today is at a higher risk of experiencing the effects of PM2.5. One of the main groups affected is children, especially those who spend a large amount of time outdoors. Their lungs are still developing, which means that they breathe more rapidly and inhale more pollutants per pound of body weight than adults. Another sector of the population that is at high risk is the elderly. But in general, those who spend more time outdoors are at an increased risk because during times of increased physical activity, PM2.5 penetrates deeper into the lungs and can cause severe damage; especially if you are near a main source of pollution, such as a busy road or in a city. It is obvious that PM2.5 can cause horrible health problems, but there are things that you can do to change the effects that it has on your health and your environment. By taking these necessary steps, you can cause a drastic amount of change and influence those around you to do the same! If you are interested in learning about the PM2.5 levels in your area, most weather stations and websites give air quality forecasts frequently. Check out the daily Air Quality index forecasts in your area for more information at www.airnow.gov. Also, there are many other things that you can do to hopefully lessen the amount of PM2.5 released into the air on a daily basis, especially when it comes to vehicles and idling. If you are going to be stopped for more than 60 seconds, turn off your engine! In your area school district, encourage a no idling policy. When the weather is nice, use alternate means to get around-walk, bike, carpool, etc. Even though it may be obvious that industrial pollution far exceeds diesel and vehicle pollution, the effects of both diesel and vehicle pollution are right in front of us. It is not just an environmental issue, but a serious health problem. Emissions are still present and harmful, even when you can’t see them. Spread the word about PM2.5 to family, friends, neighbors and school bus drivers. If we were able to cut idling time in half in the United States through education and outreach, the result would be preventing between 7 and 26 million tons of Carbon Dioxide from entering the atmosphere each year. It is an easy way to help create a more sustainable future!